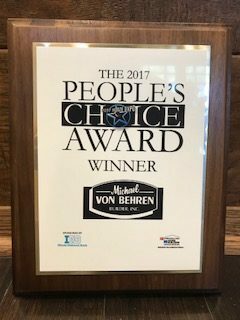 2017 Springfield Area Home Builders | Michael von Behren Builder, Inc.
Michael von Behren Builder, Inc.
Michael von Behren Builders was recently awarded the 2017 People's Choice Award for their display at the 2017 Home Expo that was held in Springfield. We would like to thank everyone who voted for our display. Copyright © 2019 Michael von Behren Builder, Inc. All Rights Reserved.